About half of all people with cystic fibrosis, the most common genetic disorder in the United States, die from a lung disease before they turn 40. A form of pneumonia called Pseudomonas aeruginosa is a likely culprit. These bacteria have become so hard to treat that the Centers for Disease Control deemed it a serious threat to the nation. “That’s the main reason I work with Pseudomonas,” said Mariette Barbier, an assistant professor in the West Virginia University School of Medicine. “It is on the CDC’s list of antibiotic-resistant bacteria of concern.” She and her research team are investigating ways to keep cystic fibrosis patients and other at-risk populations—including patients hospitalized for severe burns or recovering from major surgery—from catching this deadly illness. The Cystic Fibrosis Foundation, National Institutes of Health and West Virginia Higher Education Policy Commission are funding her work. The bacteria Pseudomonas aeruginosa, shown here, is a potentially lethal form of pneumonia that is particularly lethal in cystic fibrosis patients. It can also be deadly in burn patients and in patients recovering from major surgery. 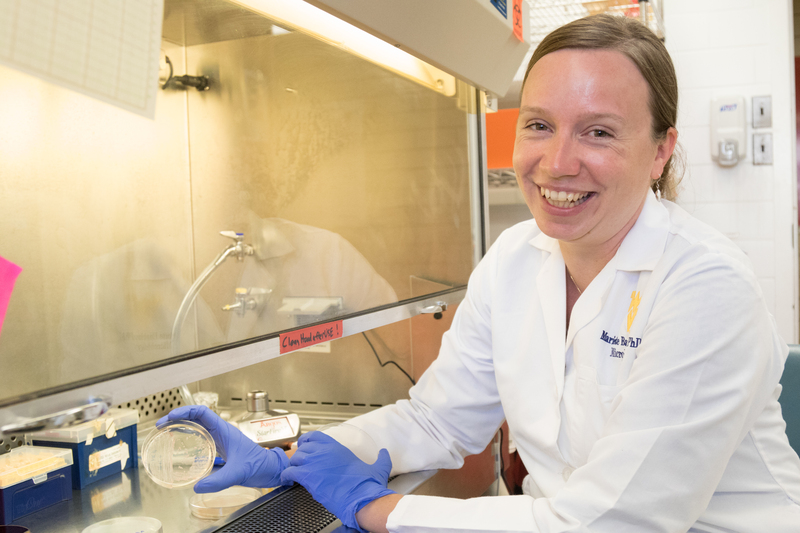 WVU researcher Mariette Barbier is investigating new ways to prevent at-risk populations from acquiring the bacteria in the first place. One reason antibiotics have a hard time conquering P. aeruginosa is its versatility. It’s especially good at adapting to new and changing environments. And if just one P. aeruginosa cell survives an onslaught of antibiotics, it can multiply into even more cells that are impervious to the treatment. Given that this form of pneumonia is so hard to cure, Barbier has focused her research on preventing infections, not just treating them. In a recent study, she and her colleagues examined what molecular-level resources the bacteria relied on to infect a preclinical model. Pinpointing this resource would hint at a new target for a P. aeruginosa vaccine. Just as bad weather can decimate a grape crop and slash a vintner’s wine production, the vaccine could block the bacteria’s access to a crucial resource and prevent infection. Barbier suspected that an RNA snapshot would give her an idea of the “weaponry” that the bacteria and host were using against each other. She was right. When the bacteria and host were locked in battle, the RNA of both the bacteria and the host instructed cells to crank out a protein tied to iron acquisition. Each side seemed desperate to gobble up as much iron as possible. “It was known for a really long time that iron was essential for humans and bacteria, but seeing it in that way—that interplay of all those proteins just trying to get ahold of it in the model—was unique,” said Barbier. So she and her team synthesized a molecule that incorporated pieces of the surface of the bacteria’s iron-acquisition proteins. They made the molecule large enough that it would reliably trigger an immune-system response. Then they injected the molecule into their preclinical models before exposing them to the bacteria again. The researchers suspected that the models’ immune system would recognize the molecule as foreign, identify the pieces of the bacteria’s protein, and use that information to isolate and destroy the actual bacteria when it appeared. In a way, the molecule would act like a wanted poster, alerting the host’s cells to be on the lookout for germs making this particular iron-acquisition protein. It worked. With the help of the molecular wanted poster, the host’s immune system killed off 99.9 percent of the bacteria. “There is a great need for a vaccine to prevent P. aeruginosa infection in cystic fibrosis patients to extend their lives. Dr. Barbier has identified an Achilles’ heel of the pathogen, which can be used to educate the immune system to clear the organism,” said Heath Damron, who directs the Center. Barbier and her team are now investigating what types of immune cell—T cells, B cells or macrophages, for example—are key to that protection. By knowing what aspect of the immune response plays the biggest role in spotting and attacking the bacteria, researchers can fine-tune a vaccine to marshal those forces. One way the researchers may tweak the vaccine is by trying different adjuvants—vaccine ingredients that boost the host’s immune system response. Another is assessing whether some modes of delivery, such as injections and nasal sprays, work better than other. “For example, what we think is that for respiratory infections, it’s really important to create protection at the site of infection because, if you already have first responders there, you should be able to control the infection must more quickly,” says Barbier. So, perhaps an inhaled vaccine would prove most effective against this pneumonia. Research reported in this publication was supported by the National Institute of Allergy and Infectious Diseases of the National Institutes of Health under Award Number 1R01AI134886-01A1 and Award Number 1R01AI123320-01A1, the Cystic Fibrosis Foundation under Award Number BARBIE10I0, and the West Virginia Higher Education Policy Commission under Award Number HPEC.dsr.18.6. The content is solely the responsibility of the authors and does not necessarily represent the official views of the National Institutes of Health, Cystic Fibrosis Foundation or West Virginia Higher Education Policy Commission.